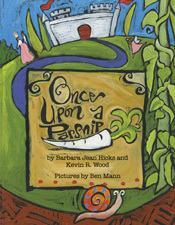 I met Carolyn Connor at a Nutrition First “Healthy Habits” conference in Seattle when she invited me to sell my veggie-related picture books in the conference hall. I didn’t get to attend the sessions, but I loved meeting the many amazing people who dropped by my booth–smart, savvy men and women who are committed to children’s health and nutrition. Nutrition First is the WIC (Women, Infants and Children Food and Nutrition Service) Association for Washington State. Their mission is to ensure that young children of families with limited resources have opportunities for better nutrition to improve overall health. 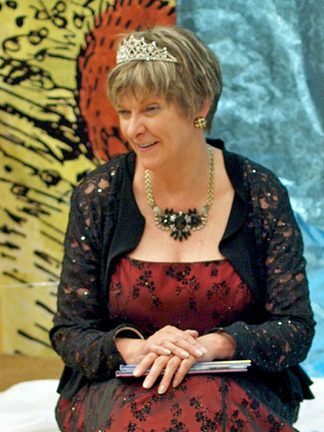 Story Queen: Thanks for speaking with me, Carolyn. First of all–let me say I like the photo! Carolyn Connor: Thank you! 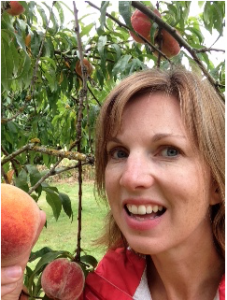 I’m picking peaches from my yard! SQ: Having fruit trees close at hand is a great way for parents to promote healthy eating. There’s a pride factor when kids can pick their own snack from a tree. I remember the huge Gravenstein apple tree in my backyard when I was growing up, and how delicious those apples were. So tell us a little bit about yourself and why healthy eating is important to you. CC: I have been a Registered Dietitian for over twenty years. Currently I am the Executive Director for Nutrition First, a non-profit in Washington State. We offer advocacy, education and training for the many people who work on behalf of children’s nutrition and health in Washington. As to your second question: Healthy food tastes good and gives you energy. That’s important to me both as an RD and a mom! SQ: What is your definition of “healthy food”? “Healthy eating”? CC: I define healthy food as food that provides good nutrition – without many added ingredients. I define healthy eating as enjoying a variety of healthy foods, enjoying mealtimes, and focusing more on what TO eat instead of what NOT to eat. I feel that healthy eating also allows for those occasional not-so-healthy foods. SQ: How can parents make healthy eating fun for kids? CC: I think letting kids pick out produce at the Farmer’s Market or grocery store is great – and letting them help in the kitchen. Parents and caretakers can also be great role models and provide structure around eating times. Kids need a healthy meal or snack every 2-3 hours. Not more often – if they snack between times, they won’t be ready to eat what is offered at meal or snack time. This has been a challenge even for me! But I’m always amazed at how much better our day goes when I plan ahead and can stay one step ahead of my boys’ hunger. When I have a plan for meals and snacks instead of letting my kids tell me what they want or letting them raid the cupboards, they seem to behave better. They also have more energy for activities when they are regularly eating healthy foods. SQ: What is your favorite healthy, kid-friendly snack? 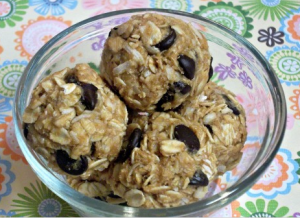 SQ: What is your favorite healthy, kid-friendly recipe? Mix all ingredients and chill for at least 30 minutes. Roll into balls. Store in refrigerator. SQ: Those sound delicious! And easy, too–no cooking, I notice. Thanks so much for joining us, Carolyn–and for all the good work you do making sure our state’s kids stay healthy. Note: Nutrition First’s Twitter handle is @NutritionWA. Their Facebook page contains links to health-related articles. Here are a couple of recent links I found interesting: The relationship between diet drinks and weight gain and Parenting to prevent childhood obesity. Photo credits: Carolyn Connor, lovetobeinthekitchen.com. Love it, John! As always, you and Jen are way ahead of the curve!